The Idealist Lexicon.—1. The Conjurer of Alexandria.—2. Pure Assurance.—3. The Child's Riddle.—4. The Enchanted Castle.—5. A work of an Idealist Tendency. 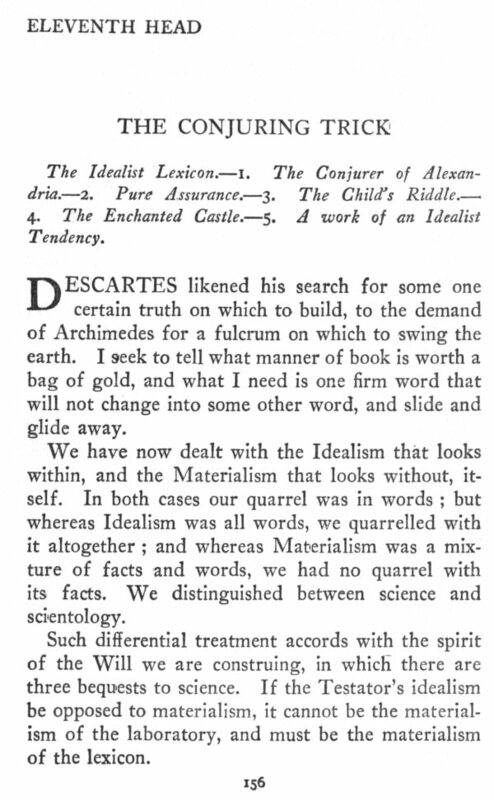 DESCARTES likened his search for some one certain truth on which to build, to the demand of Archimedes for a fulcrum on which to swing the earth. I seek to tell what manner of book is worth a bag of gold, and what I need is one firm word that will not change into some other word, and slide and glide away. We have now dealt with the Idealism that looks within, and the Materialism that looks without, itself. In both cases our quarrel was in words; but whereas Idealism was all words, we quarrelled with it altogether; and whereas Materialism was a mixture of facts and words, we had no quarrel with its facts. We distinguished between science and scientology. Such differential treatment accords with the spirit of the Will we are construing, in which there are three bequests to science. If the Testator's idealism be opposed to materialism, it cannot be the materialism of the laboratory, and must be the materialism of the lexicon. Where does that opposition begin? The last word of Materialism is not Matter, but Power. We have seen that in many ways. We have seen the demon in the falling stone, and the man in the going crumb. We have seen it still more clearly in the dissected atom, which proved to be all demon, and no crumb. The abiding mystery in the material universe is strength. Strength is, not the last word, but, verily speaking, the first word, in the scientific lexicon. It is the word which science has not explained, but by which she explains all other words. What is the first word in the idealist lexicon? What is the word that denies Strength? "A point is that which hath no parts, and no magnitude." With these words began a book which was put into my hands, of course without the slightest warning of what it was about, when I was twelve years old. I need not remind any one that, like the Latin Grammar, it was a Mediterranean book, written in Mediterranean words which I only half understood. The Romans did not write the book, any more than they wrote the Latin Grammar or the Catholic Creed. In school they were themselves Babus. [paragraph continues] Dogma streamed on Europe for two thousand years from the great lighthouse of Alexandria. The Greeks themselves did not write the dogma; their share in it was the editing. They were vikings who ransacked the temples of buried cities and forgotten realms, and brought forth the hoards of knowledge into the marketplace. They were publishers, and Alexandria was their chief publishing house. Euclid himself was no famous geometrician, but an immortal editor. This book of his is like a hard, bright crystal imbedded in the human brain. To me it came as literature, and I can still recall the pleasure with which I read the opening pages. I thought the ancient Alexandrian the ablest writer I had ever met with, the one who knew most surely what he wanted to say, and said it in the surest words. Those axioms, I remember, struck me as marvels of verihood; I was not awake to see that they had told me nothing but that more is more than less, and less is less than more. flat world, a world in which there was neither height nor depth, neither up nor down, neither top nor bottom; and now, hey presto! he had jerked me out of the flat world back into the real world in which thin pieces of paper can be picked up and set down on the top of other pieces. I was surprised in the same way as Alice when she saw the cat in Wonderland go away and leave its grin behind.—How long have we all dwelt in Wonderland, and watched other Mediterranean wizards working their famous spell that changes the cat without changing the grin? And now I have to see whether this hard, bright crystal can be a fulcrum for the mind; if in the lexicon of Pure Earth-Measure there is any word by which I can measure the Testator's word. Was not "exact" one of the explanations of "idealist?" The word Mathematics seems to mean assurance, or making sure; and that being so we can understand why Bacon called it the handmaid of the sciences, and why Descartes wanted to make it the maid-of-all-work. knowledge into science. In doing so, as well as in whole groups of words, they showed their growing trust in the eye. This turning towards the light has its bodily counterpart in the great brain-growth towards the eyeballs, a growth wrought partly by the chemic power of light and thus a real bridge between chemistry and wakefulness; a growth which has helped to shape the human skull, and so made man a child of light. But the eye only sees in two measurements; it can see length and breadth, but thickness it cannot see. The sense of sight is but a daughter of the sense of touch; the eye a magic finger reaching forth into the abyss. Again, there are two sides to making sure, and one of them is the thing that you make sure of. Sights come and go; the sun himself is a mere season-ticket-holder of the sky; your moon changes like a woman's temper; that big blue cave of stars is not half so steady as one's own cave. Only the firm earth beneath your feet is fixed. You measure that, you go by steps, and you know where you are. It did not need the overflowing of the Nile, nor the Egyptian Delta, to make Geometry the mother of mathematics. to measure what you measured by, and make assurance doubly sure. In the end some unknown Andrónikos arose, and said,—Let us forget there was ever real ground, or a real foot, or a real pair of human, or of compass, legs, and make believe that we are measuring Pure Ground with Pure Measures. And he called his science, or his language, Pure Assurance. Now here is Idealism in its nakedness. I do not mean that it is the idealism of our Testator. I do not claim this bequest for works of a mathematical tendency. But as it was in the mind of Plato, so this is in the general mind, the embryo of idealism, and therefore it cannot be passed by. The first word in Euclid's definition is point. He makes-believe to begin with that. But he can only tell me what a point is by telling me what it is not. Every definition is a not. An outline can only be gained in battle. The simplest definition follows the yea and nay of electricity, as in the case of truth and verihood. [paragraph continues] Assurance, Euclid has assumed the three dimensions of space in telling me that his point has none. Which, as he would say himself, is absurd.—There is a good deal of absurdity in Euclid. His aim is to make-believe that he is starting with the point. And so instead of working down to it fairly, he pretends to create it. It is another conjuring trick. The juggler claps down his magical dice-box over size, and when he lifts it up, hey presto! size has vanished, and the point is there instead. In a school-book that is unfair. The abstraction ought to be abstracted before the schoolboy's eyes, and not popped on him from up the conjuror's sleeve, as if it were some real thing made of imponderable Matter. Which, to translate Euclid, is unheard of. venerable quack ought to have brought his flats and lines and points before my mind's eye, when I was twelve years old. We have not Euclid's handwriting before us, and we know that Mediterranean copyists sometimes take freedoms with their text. One of Euclid's copyists seems to have felt that there was something false about the point, and he has tried to mend matters by saying that a point is that which has position. I am reminded rather painfully of a certain Energy of Position which gave us some trouble a short way back. To say that a point has position is to say that it is fixed; and you cannot fix a point without having at least one other point to fix it by: and as soon as you have got two points side by side you have got a line. And so we work back by another road to the real starting-point, the point from which the science of fanciful Earth-Measure did indeed start, namely the solid earth. Euclid has put the cart before the horse. Which is unheard of. I am not ashamed to say that I have found more sense in a child's riddle than in all Euclid's definitions—though they are also in their way a child's riddle. It runs,—How many sides has a round plum-pudding? And the answer is—two, an outside and an inside. [paragraph continues] All-Thing as well as of the atom. It is, if I must wield these enchanted weapons, the shape of space itself—the mind-shape. The child's plum-pudding brings before us the unreality of all the flats that Euclid deals in, showing us that there is no halfway house between nothing and the whole ball. I am reminded of another famous dogma in which the thundering adjectives roll to and fro, from One to Three, and back from Three to One. All unawares, perhaps, the mind that gave birth to that mighty inspiration was reasoning from One Space in Three Measures to One God in Three Persons. If it be not the creed of Athanasius it is the creed of Alexandria. 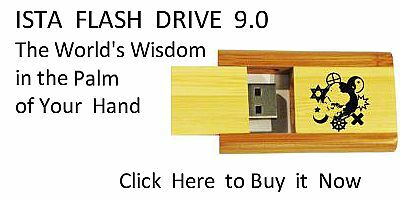 Perhaps the minds for whom the word One is the truest word in speech, whether they write it Monotheism or Monism, are shallower than they think they are. Those flats of Euclid's are eye shapes, and their power over the mind is owing, not wholly to the early man's belief in a flat earth, but in some measure to that enlargement of the eye nerves which makes our brain, as it were, lopsided. We like to think in flats; our explanation is a map. And since the world is round, the map is false, and what we gain in clearness we lose in verihood. these flats without thickness, this whole denial, not merely of strength, but of reality. The science of Pure Earthmeasure is the science of Tidy Shapes. Whereas we know that real shapes are always ever so little untidy; the ball is not quite round, the face is not quite flat, the line is not quite straight, the point is not so fine as nothing, and it is not quite fixed. As soon as Pure Assurance undertakes to assure us of anything beyond its own purity, lo! the triangle is no longer equilateral, and the parallel lines run together, and we have to fall back upon the landsurveyor's chain, and use compasses of wood and brass. Alas! is even the purity of Pure Assurance free from scandal? Do we not hear of negligible quantities being brushed aside, as Pure Physics brushes its scandals into the Ether? Is not the enchanted castle of Pure Earthmeasure haunted by a restless spirit that even the wizards cannot exorcise, a ghostly circle that will not be squared? and put forth their puny blossoms in the shade. Yet greater pity for those that pine and are denied the light, that climb and are forbidden, that bud and may not flower,—for the sound crucified to save the sick. For my part, when I stand outside the Roman forcing-house, and see the gardeners inside training the plants entrusted to their care; driving their nails, and turning on their Alexandrian gas-jets, and shutting out the day, I watch them with other feelings than reverence. I see the tired heads droop in the foul air; and I want to break open the door of the forcing-house, and draw forth the nails, and turn out the gas-jets, and let in the light of heaven. Once when I was in Delft I visited the house where William the Silent was murdered by order of the Catholic King. And looking out of a window into the courtyard I saw some flowers in pots standing in a corner over which the shadow of the wall had crept. And while I looked a girl came out into the courtyard, and took up the flowers, one after the other, and moved them out of the shadow into the sunshine again. Then I said to myself,—Lo! here I have seen the work of William the Silent: he saw the black shadow of Spain creep over his country, and he brought his countrymen out into the light of freedom again. To me, while I looked, this also seemed to be a work of an idealist tendency.